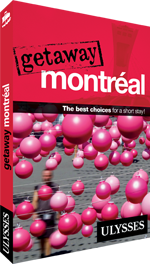 Getaway Montréal from Ulysses Travel Guides is the perfect tool to make the most of a short stay in Québec’s largest city, Montréal. Thanks to its practical format and organization, the traveller will find all the essentials and must-sees in a glance. Fun to consult and to carry thanks to its small format, its colourful and lively layout includes numerous photos of the destination.